Italian eateries in Leicester had something of a renaissance when Claudio Ranieri was in town. It seems no-one in the city who ever ate in an Italian restaurant or gelateria was safe from bumping in to him. He won plenty of friends in those restaurants by maintaining his quiet charm and eating well. When he left his job at Leicester City, he popped back to town to pack up his house, and for one last meal out. As he left everyone, from waiters to customers and kitchen staff stood and applauded him out of the restaurant. I dined at one of those Leicester Italians recently, Oggi on London Road. It’s a small neighbourhood restaurant with a regularly changing specials and fish selection. They have a fairly small wine list, with some popular choices and a few more niche ones imported from Italy. I chose a Sicilian white for the fish eating end of the table, hoping for some delicious volcanic flavours, but sadly they were sold out. I was a little disappointed, but not as visibly disappointed as the waiter when one our meat eaters asked for their lamb well done. 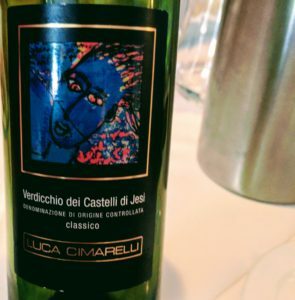 I opted for the Verdicchio dei Castelli di Jesi from Luca Cimarelli instead. The painting on the label was a little alarming, but not the full on Francis Bacon. The wine was a rich lemon colour. It smelled fresh with a good dollop of fruitiness. It was dry with a quite a marked acidity. That acidity was complemented by a little parade of citrus with some lemon and lime bulldozed by a big rolling thump of grapefruit. Underneath that was a sort of warm straw flavour. Checking the wine list Oggi had described it as having aromas of broom, which I assumed to be a weird mis-translation or transliteration of something else, but really, I could see where they were coming from if you imagine a brand spanking new old fashioned pioneer style American corn broom. I suspect I’d stick with straw if I was doing the marketing. I’d expect to pay about £8-9 for this bottle retail so £19 in a restaurant was a good deal. This was a well outstanding informative post you have shared on this page about the Pinks to Chase the Blues Away because It’s a very spare rosé, offering watercolor sketches of strawberry and raspberry with hints of violets, smoke and graphite and a background of chalk and flint. Delicate and ethereal, it lingers not a moment but leaves behind a memorable nexus of evanescence.